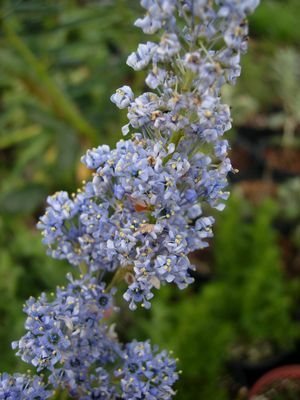 'Ray Hartman' is one of the most commonly grown selections of ceanothus in California. Why? 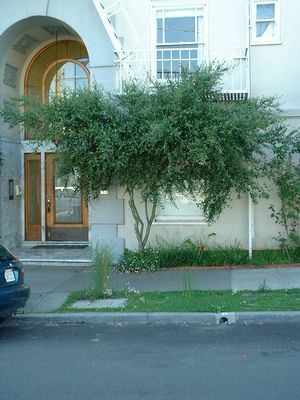 Because it's one of the least finicky of this popular group of shrubs and it looks good. It performs reliably well in both coastal and inland locations, is tolerant of clay soils and summer water and can easily be pruned. The following history of Ceanothus 'Ray Hartman' is taken from Ceanothus by David Fross and Dieter Wilken (2006 Timber Press). "Ray Hartman is a cross between Ceanothus arboreus (tree ceanothus) and Ceanothus thyrsiflorus var. griseus. 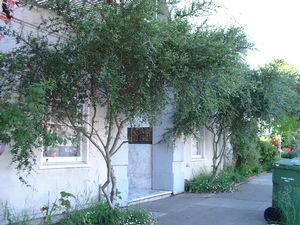 The orginal seedling was collected in Saratoga and grown at Leonard Coates Nurseries in Morgan Hill. Howard McMinn was the first to evaluate and distribute plants and for a brief time in the late 1940s, it was named 'Blue Sky' ceanothus. Saratoga Horticultural Research Foundation renamed the plant and introduced it in 1954 with the approval of the Coates Nurseries and Everett Farwell of Oak Knoll Nursery who had sold it as 'Blue Sky.' It was named in honor of Ray Hartman for his lifelong interest and advocacy of California native plants." Ray Hartman is one of the largest selections commonly available. It's a fast grower, rapidly reaching 12' tall and wide. In time and left unpruned, it can reach 20' tall and wide. The leaves are oval in shape and usually between 1½-2½" long. They're dark glossy green on the upper surface and grayish-green on the underside. The flower buds are lavender-pink and covered in silky hairs. 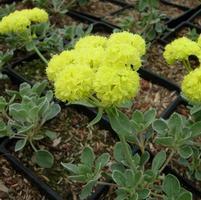 They open to form large, oval-shaped clusters, about 3-5" long, of medium-blue flowers that bloom in early spring. The flowers are mildly fragrant and attract butterflies, bees and other beneficial insects. Ray Hartman grows best in a sunny location. It's tolerant of light shade though, but just won't bloom quite as profusely. It can be grown as a multi-trunk shrub, or trained as a small single-trunk tree. The dense foliage makes Ray Hartman useful as a screen or hedge.